So you have an iPad (or two) in your home, you use it for everything and it is fast becoming the hub for home entertainment and internet access. But where do you put it? Where do you charge it? Does it have a home? 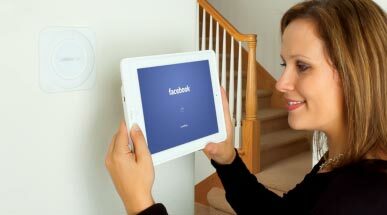 You need a convenient location where the ipad is always available and fully charged, ready to go. Introducing LaunchPort – a revolutionary way to charge, hold and protect your iPad in your home. The LaunchPort system consists of a Sleeve and any number of Stations. A Sleeve is a case that wraps around your iPad and protects it. A Station is the mount and charging unit that interacts with a Sleeve and allows rotation of the ipad in portrait or landscape. LaunchPort eliminates wires from your life and provides a seamless and easy system for keeping your iPad always charged. Perch your iPad on a BaseStation and use for typing, viewing apps and content. Place on a WallStation and use as a digital picture frame, information centre, or just a control system for your home entertainment or home automation. The ipad is charged wirelessly and safely through magnetic induction. The magnets are located on the Sleeve case which means you can also mount it to any metallic surface such as a refrigerator in the kitchen. We supply/install Launchport as we believe it to be the most convenient and neat solution to wall mounting or table mounting an ipad. Cheap all in one programmable remote controls (which never work properly), or sophisticated (and very expensive) professional LCD remote devices could become a thing of the past. There is now a reliable programmable software solution which can turn an ipad into a fully functioning remote control centre for all AV equipment, as well as many other services such as lighting, heating etc. Introducing Demopad – an innovative Graphical User Interface for home automation / universal remote control, available as an App from itunes. We are trained programmers for Demopad™ software that can be installed on any ipad or iphone through the App store. This application offers simple but sophisticated control of all AV devices through either IR or IP. Once installed, we can present you with a beautiful and bespoke user interface for easy control of your home. By partnering Demopad control with a Launchport docking station, then we believe you can have the ultimate combination for home automation.